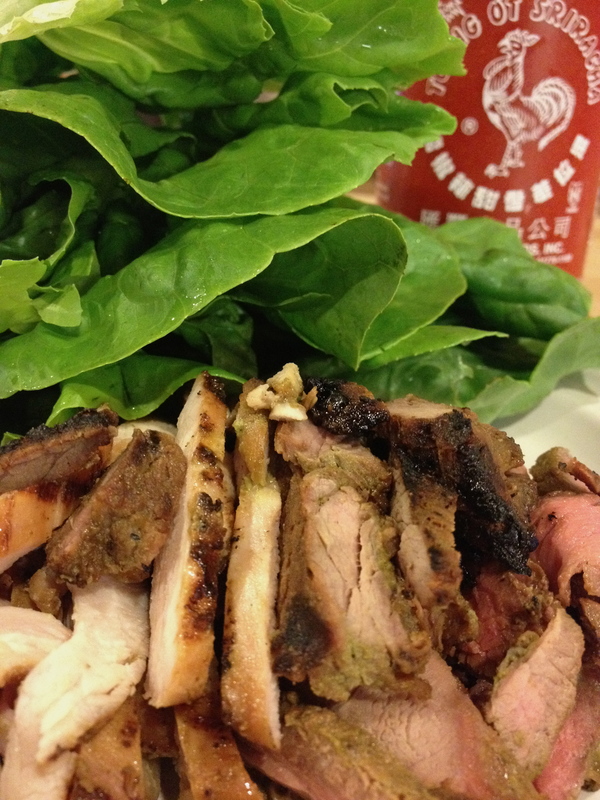 Marinated chicken and beef in the foreground, with the all-important Sriracha. With the recent heat wave seemingly behind us, this Sunday’s dinner called for something light and easy. Jeff came across this bulgogi marinade recipe a few months ago, and it’s the third time he’s made it. Based on the popular Korean dish, this recipe comes from Mark Bittman and calls for beef. We’d done it with chicken one time and with beef another, and last night — what the hell — we did a twofer: round steak and chicken thighs. 2 to 3 pounds chicken or beef. Put all the ingredients except the meat in the Vitamix, and blend until smooth. Add water as needed (Jeff used about 1/2 a cup). Reserve about 1/2 cup of the marinade to use as a sauce. It’s tremendous. You’ll want to put it on everything. Pour the remaining marinade over your choice of meat and mix to coat. (Bittman slices his beef before marinating, but we feel that complicates the grilling. We cooked the meat pieces whole and sliced them later.) Marinate for up to two hours before cooking on a hot, hot grill. 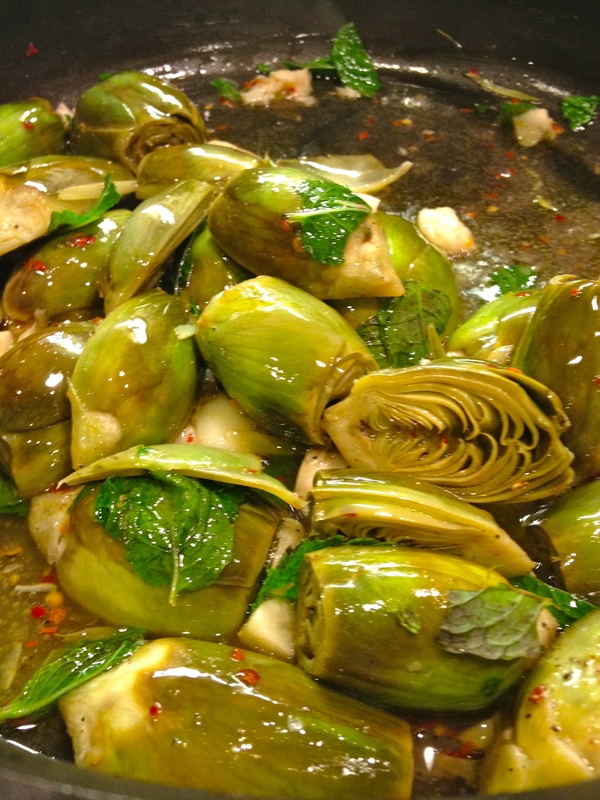 Baby artichokes with garlic and mint. And now for something completely different ..I adapted this recipe from Mario Batali’s cookbook Simple Italian Food – Recipes from My Two Villages. Remove the tough outer leaves from the artichokes and shave the stems. Cut larger ones in half lengthwise and place in acidulated water. In a large skillet, heat the olive oil and the garlic until it is just golden. Drain the artichokes and place them in the pan stirring to coat with oil and garlic. Add the red chile flakes and a splash of wine and cook for 10 to 12 minutes, adding a little more wine along the way to braise the artichokes and keep the garlic from getting too brown. Season with salt and pepper, and about halfway through, add the torn mint leaves. Serve warm as a side dish, or as we did, as a first course. This would also be delicious tossed with fresh pasta. OH – the photo of the baby artichokes, how beautiful!. Very good idea, Farmers Market, etc. Save me some, I’ll be right over.